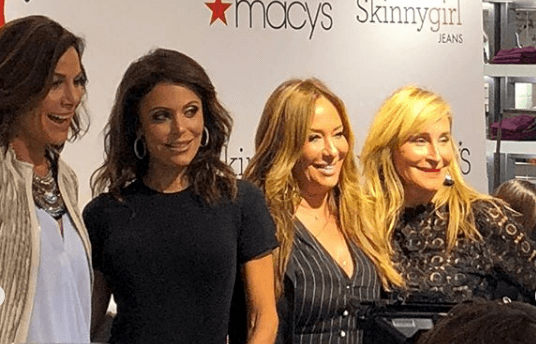 Bethenny Frankel Launches Skinnygirl Jeans Line At Macy's! Bethenny Frankel Launches Skinnygirl Jeans! Bethenny Frankel launched her Skinnygirl Jeans line at Macy’s Herald Square in New York City, on Wednesday evening. This would be her first public appearance since the shocking death of ex boyfriend, Dennis Shields, in August. She opened up to “Extra’s” AJ Calloway about the loss. Press play below to watch. The NYC entrepreneur included some of her fellow Real Housewives of New York City co-stars for her Skinnygirl Jeans launch: Luann de Lesseps, Sonja Morgan, and newcomer, Barbara Kavovit were on hand to celebrate Frankel. The ladies had an impromptu dance party to “Crazy in Love“ and a mini #CountessAndFriends performance in honor of the Skinnygirl Jeans launch. Swipe to see more video. The Skinnygirl Jeans line debuted with a full collection of jeans as well as skirts, knitwear, and a classic denim jacket — offering a range of styles and sizes, including plus sizes. MUST READ: Bethenny Frankel Remembers Dead Ex Dennis Shields By Comparing Him To A Dog After His Funeral! Unlike its name, the brand celebrates women of all sizes — raging from 24 – 32 and 14W – 24W. “We believe every woman deserves to feel confident and live free from judgments. It’s not about a shape or size, it’s about every shape, every size, and every woman,” reads a statement on the company’s website. The items are priced at $89.50 – $169.50 — available at shopskinnygirl.com, Macy’s, and soon launching at Lord & Taylor, Belk, and HSN.